Posterity, perhaps, will judge the first 2 decades of the 21st century for either one of 2 reasons. It will either reaffirm the unwritten unsaid faith of a vast majority of realists and almost every pessimist that this is yet another decade when the disparities between the haves and have-nots will widen further and the Earth, for most of its inhabitants, would become an even tougher place to survive. Courtesy an ever increasing income chasm between the rich and the poor especially in the developing world coupled with an ever increasing mercury of the planet, these 20 years might just prove to the pivotal point for humanity towards an apocalyptic world we got glimpses of in the recent Matt Daemon flick Elysium. While India’s Mars Orbiter Mission (MOM) raged first ever truly public debates in independent India’s history over a science and technology project, China, in its own diplomatically pompous manner, launched its first ever moon rover mission, the Chang’e 3 on December 2, 2013. Since expression of dissent against any state policy/project is a mild synonym for treason in China, there was an almost unanimous applause within the People’s Republic for crossing another cosmic milestone and, as has been the norm in the last decade, the applause was echoed around the world. But India’s MOM, while largely receiving positive views among the scientific community across the globe, has been lambasted in many significant media outlets and by prominent intellectuals from various fields both within and outside the country. But the real Pandora’s Box here is the myopic viewpoint. Before questioning the motive, relevance or usefulness of such a mission for a nation consisting of the world’s largest number of poor, we must first define the context under which such questions are raised. And this is where many, both for and against India’s MOM, miss the point. First of all, the context here is that the current level of scientific and technological knowledge coupled with economic potential has enabled both India and China to take bigger and bolder steps in space exploration and space science since the turn of the century. Secondly, there is a massive and indisputable body of evidence in favor of offshoots and derivations from space technology having found applications in day to day life for masses across the globe (refer to my blog post last year dated July 06, 2012 - “The Indian LSD Deficiency Syndrome"). Products from everyday cellphone communication and water filters to services like TV broadcasting, weather monitoring and remote sensing are all possible due to direct application or indirect spin offs of technologies developed for space missions. But, then, a very relevant and obvious question is – Why are we not focused on only launching better and diverse satellites which directly aim at improving the lives of the poor in India instead of wasting Rs.460 crore (US$73 million in terms of average dollar to rupee exchange rate in last 6 months) gazing at Martian red dust? That’s where most miss the critical pieces in this jigsaw puzzle. Those pieces are categorically 2 in number. First one is the mastering of certain critical technologies that will go a long way in launching heavier payloads, both diverse satellites as well as future complex scientific payloads. ISRO’s launch vehicle which carried Mangalyaan, the Polar Satellite Launch Vehicle (PSLV), positions payloads upto 1900kg either in the Sun Synchronous Orbit (SSO) or the Low Earth Orbit (LEO) (these orbits are used by earth observation and weather satellites) raised the bar many notches with MOM. PSLV has, for the first time, mastered a much longer 4 stage ignition lasting 43 minutes than the usual nearly 18 minutes to put a remote sensing satellite in orbit (roughly put, every launch vehicle has multiple stages in terms of fuel containing boosters in each stage which are fired at the right time, right position and right orientation of a spacecraft to place it in the right orbit or to raise the orbit) to place Mangalyaan in the appropriate orbit around Earth from where the spacecraft's own engine took over. From there, Mangalyaan’s own propulsion system, were fired in 6 maneuvers to provide it the requisite velocity to leave Earth’s Sphere of Influence (SOI) (sphere of influence is roughly a huge sphere around earth in which Earth’s gravity is more than that of the sun. There are similar SOIs for every planet and moons) and follow a trajectory towards Mars. This process of igniting the 440 Newton engine of the spacecraft to make it leave Earth orbit and slowly move out of Earth’s SOI is called TransMars Injection (TMI) and India is only the 5th nation apart from US, Russia, EU and Japan to have achieved that. The second and perhaps the standout technological achievement for ISRO will be the 3 levels of autonomy provided to Mangalyaan once they work effectively throughout the duration of the mission. When Mangalyaan is at Mars, any signal will take a little above 20 minutes to travel from Earth to Mangalyaan and vice-versa. Thus there’s a 42 minute delay in a command from earth to reach back Mangalyaan after Mangalyaan sends any signal about any glitch or change required in maneuvering the craft when it is near Mars or in Mars orbit. Thus the 3 level autonomy has ensured that all necessary mission tasks at various stages be completed by Mangalyaan itself once it is at substantially huge distances from Earth without needing commands from Earth especially when the craft is close to Mars or in Mars orbit. Now, achieving the above technological capabilities in carrying out complex navigation in deep space, orbital raising/lowering maneuvers and system autonomy achieved by PSLV during MOM will be critical assets for India to be a major player in the emerging global space industry which is the 2nd piece in the jigsaw puzzle justifying the credibility of MOM and similar deep space missions for India. And herein lies the real motive behind this mission. In 2012, the global space economy size was $304 billion, a growth of 5% while the global satellite industry grew 7% clocking $190 billion in sales. Satellite launch industry revenues, which reflect revenues through launches made in an year, grew 35% year-on-year (yoy) from 2011 to 2012 with US revenues alone reaching $2.2 billion from $1.4 billion. Within the space industry, satellite manufacturing revenues, again portraying in-year satellites launched, rose 23% to $14.6 billion. Since ISRO, has already made over 100 launches since its inception around 50 years ago, this is like missing out on the Great California Gold Rush despite being very close to the gold mines. ISRO has over 400 registered companies providing components and small parts to be used in various space based and ground level systems used in various missions and ground settlements of the agency. However, successive governments are still stuck in the socialist era mindset of restraining to unleash the commercial potential lying idle under the ‘pious’ aim of working for nation building and providing better life standards to the common people. As usual, our policymakers forget that huge productive assets have been created which can add massive value both in terms of India's own communication, earth observation and weather monitoring satellites and also providing massive services to other countries in areas like satellite launch/manufacturing and other space based services. Until now, ISRO’s major workhorse, the Geo Synchronous Launch vehicle (GSLV) has developed its first variant, the GSLV Mk1 (a), (b) & (c) with Mk 1(a) & (b) having maximum load carrying capacities of 1500 kg and1900 kg respectively to Geosynchronous Orbit (this is the orbit in which communication satellites are placed). 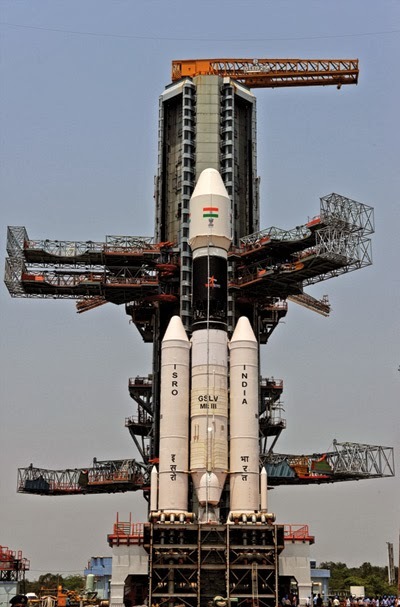 The first ever successful flight of GSLV took place in 2001 and it has had some success with 2 successful launches, one partial success and 2 failures. The second variant, GSLV Mk2, able to carry upto 2500 kg took 10 years to develop till 2010 for its first test flight but hasn’t had a successful commercial flight yet. The 3rd and latest variant GSLV Mk3, targeted to carry in excess of 4000-5000 kg is in development stages as of now. But, the GSLV Mk1 & Mk2 cannot place heavier communication satellites generally used across the globe. However that’s not the case with PSLV. As per a Euroconsult report in 2009, a Paris based research & analyst firm, over 76% of all communication satellites (not other categories of satellites) to be launched in the period 2012-2018 weigh over 3500 kg which means India still doesn’t possess the proven launch capability to cater to that market but can target the remaining 24% with its GSLV Mk 1 variants. But, as per Euroconsult, there would have been 951 satellites (earth, weather observation, navigation etc.) in the sub-1900kg category to be launched in the period 2009-2018 as per declared private and government programs. 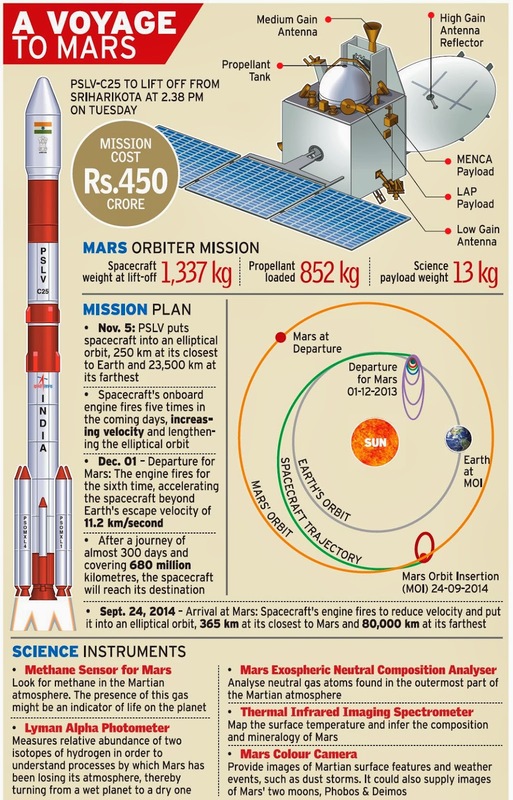 All these can be carried by PSLV which has already had 23 successful launches till date in the sub-1900 kg category. To what extent have we lost because of our government & policymakers’ innate desire to rarely look beyond the 2-3 year election cycles (since major states’ elections happen almost every 2 years) can be gauged from the fact that average satellite costs for this decade (2010-2019) is estimated at $99 million with average launch price at $51 million. 5 years have passed in that 10 year time period. So, around half of that market might be already captured by now and remaining would soon be gone. I will dedicate an entirely separate blog post to the total commercial opportunity available in global space industry in future and how India and China fit into the picture and to what extent India has lost its way to the space goldmines despite being so close in last few years. But, as far as MOM is concerned, just like innumerable spinoff space technologies became ubiquitous in our daily lives, in what unfathomable ways will deep space navigation and system autonomy capabilities going to find applications in various fields where the masses will benefit remain undiscovered. And that's where the issues of relevance and usefulness which I mentioned in the early part of this article gain ground. But until we take those small steps, we’ll never get to take the giant leap. But to wait to bask in the glory of an elusive utopian state where the state will first provide toilets, drinking water and power to every head in the soon to be most populous nation on earth and then to think about investing in new age science and technology is nothing but a self defeatist ideology. We have had atomic energy, space technology, mobile phones, internet and biotechnology which have served the entire population in bettering their lives some way or the other but we still haven’t provided toilets, drinking water and power to 40% of population. Simply because there is no accountability in the system to ensure where the allotted money for every field is going and not because $73 million has been robbed off from a ‘forever poor’ Indian’s would be toilets and packed in bags to orbit around Mars.